In case you haven't noticed, the ombré trend has pretty much taken hair color by storm. But this gradual change in hue — from light to dark or vice versa — doesn't just apply to your stunning locks. From eyeshadow, to yep ... that's right, every inch of your home, this colorful craze can be seen just about everywhere. And it's easy to see why, too. Ombré is such a fun way to express yourself, regardless of your decor aesthetic. More of a minimalist? Try barely-there grays. Or, if color is more your thing, be bold and paint an entire wall. Whatever your preference, here are 11 ridiculously cool ways to bring this chromatic style into your playful pad. 1. Add some color to your dining room. Many of today's chicest interiors are all-white. And while this monochromatic trend is gorgeous, we're also big fans of a bright pop of color every now and then, too. These solid ombré shutters from Shutterly Fabulous are a fun and playful way to liven up your digs and your dinner parties. 2. 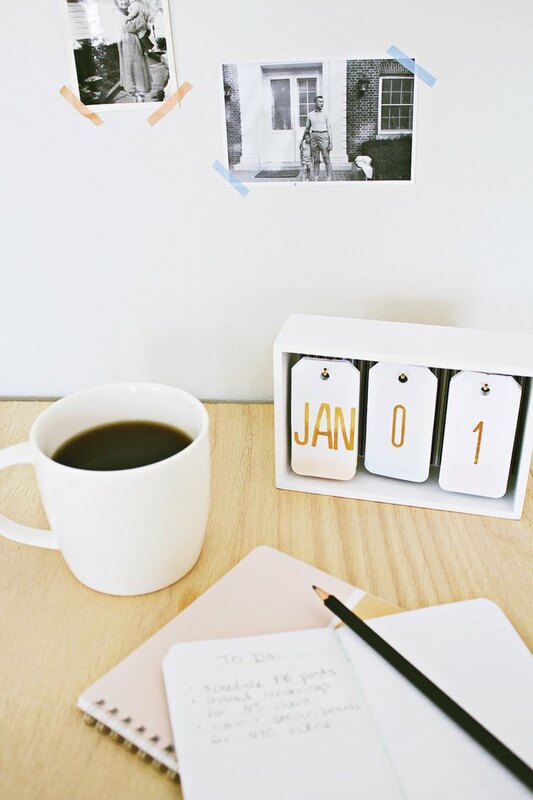 Give your desk calendar a colorful makeover. Some days work might feel like drudgery. But you can easily turn that frown upside down by upgrading your home office with this easy-to-DIY ombré desk calendar. Glitzy gold lettering and subtle watercolor-style hues make the perfect pair. Check out the step-by-step instructions at Annabode + Co.
3. Up your #shelfie game. This DIY ombré bookcase will take your shelfie game to new heights. 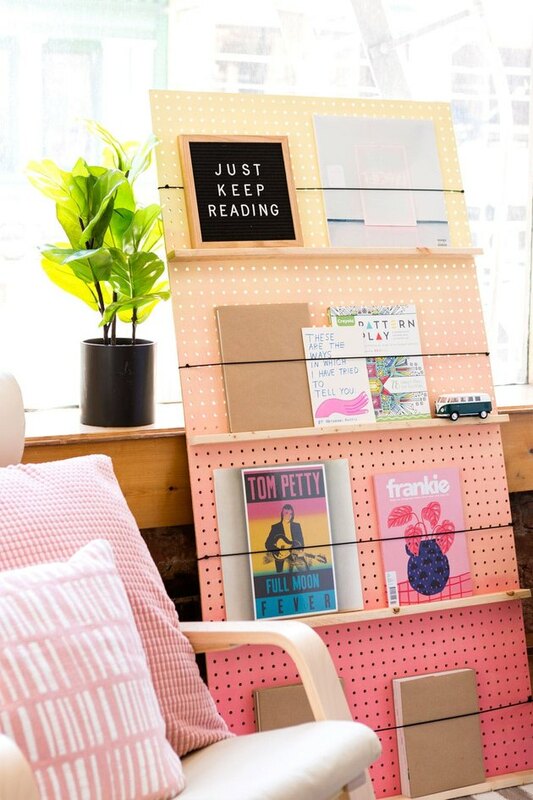 Learn how to transform a pegboard into a colorful and functional piece of art by following these directions. 4. Give your your dining chairs a pretty makeover. Bored with your old furniture? Or, maybe you just want to show some TLC to your latest thrift store find? A little paint can go a long way, and before you know it you could be sitting pretty on your better-than-new ombré chairs. Learn how Brittni from the blog Paper & Stitch DIY'd this pink beauty. 5. Take the stairway to ombré heaven. Your staircase makes an ideal spot for toying around with the ombré trend. Paint each riser a slightly different shade, like Natalie from the blog Arsenic Lace did in her boho-chic digs. You'll never look at going upstairs the same way again. 6. Deck out your bed with dreamy hues. If you don't want to deal with DIY painting projects, consider upping the wow-factor in your bedroom with just a few cozy ombré accents. Mette from the blog Monsters Circus added this dreamy aqua accent pillow and throw to transform her bed into an oasis of slumber. 7. Make a statement in your entryway. 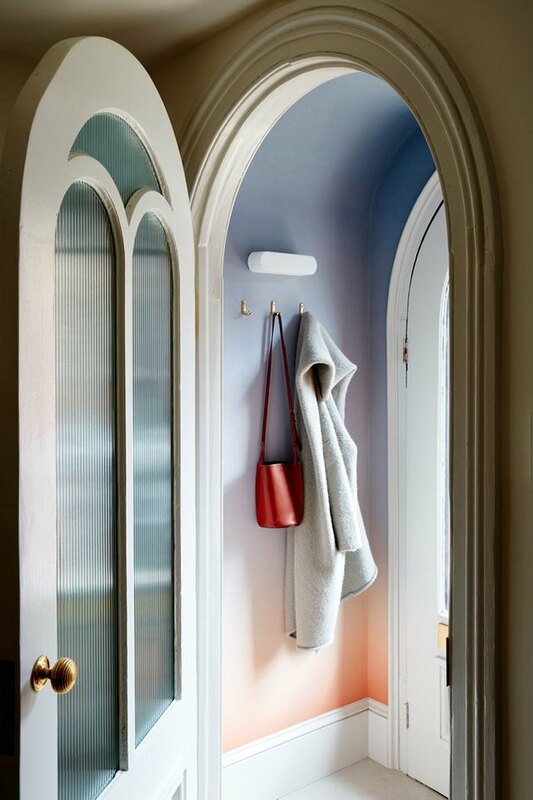 Wow your guests by turning your entryway into a stunning ombré showcase. This clever Brooklyn townhome mimics the sunrise with an orange-to-blue gradation that warmly welcomes visitors into your home. An ombré wall might make you a tad bit nervous, but when the end result looks as good as this, you might just fall in love with the idea. We sure did after seeing this gorgeous pastel room designed by Masquespacio as part of a language school in Spain. There's something so casually glamorous about curtains pooling on the floor — doubly so when combined with an ombré effect. Pick up some plain white drapery panels so you can DIY these chic window covers, which bring the perfect amount of color without diminishing this home's boho appeal. 10. Warm things up with a cool gray area rug. Ombré doesn't just apply to bright shades. Instead of bold blues, vivid yellows, or hot pinks, why not try gray, instead? This shag runner ( $107.99 ) feels cool and cozy — just what you need to keep your feet nice and toasty when walking around on chilly nights. The right decor can turn your nightly dinner into an affair to remember. These aqua dip-dyed napkins will set the stage for a tantalizing meal whether dining alone or throwing a colorful soiree. Check out this super-simple napkin DIY from the blog A Beautiful Mess.